"The just-signed treaty is of epoch-making, historic importance," Russian President Vladimir Putin said. 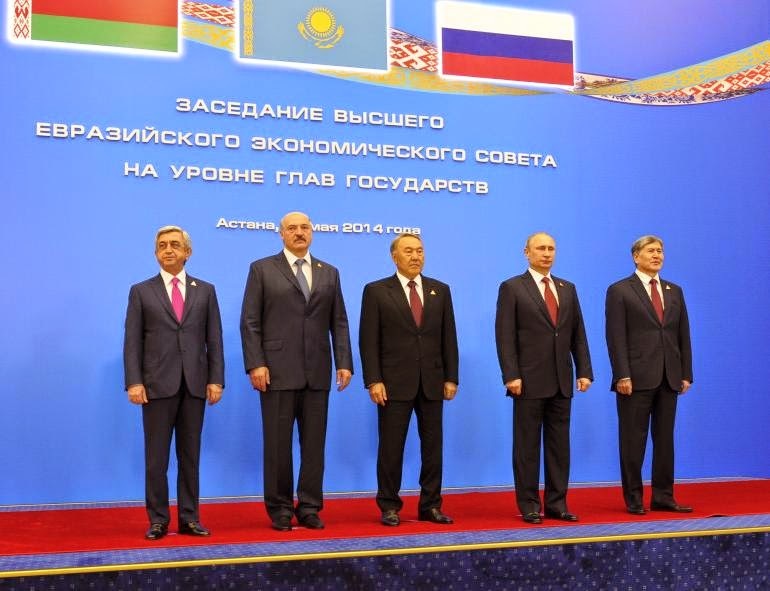 Kyrgyzstan's economy minister says Russia will allocate $1.2 billion to help Bishkek join a Moscow-led customs union. 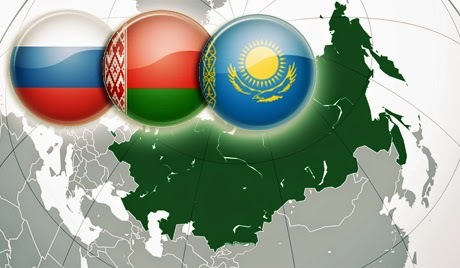 Temir Sariev told RFE/RL on May 30 that $1 billion would be given to Kyrgyzstan by Moscow as a long-term loan, while an additional $200 million will be classfied as a Russian grant to help implement a "road map" for Kyrgyzstan joining the customs union. Protesters in breakaway Abkhazia on May 29 called for joining Russia's Customs Union with Kazakhstan and Belarus in an apparent bid to win Moscow over to their side as they push for the ouster of the Black-Sea territory's de-facto government. “We count on Russia’s support in this matter,” declared a joint statement of the opposition groups who have defied the rule of de-facto President Alexander Ankvab, Kavkazsky Uzel news service reported. The parliament of Georgia's breakaway region of Abkhazia has voted to hold early presidential elections in August, a deputy said on Saturday, in a move denounced by the prime minister as "revolutionary" after the opposition seized control. "We asked him (Ankvab) to step down two days ago. Today we decided that we can simply set up new elections," opposition deputy Beslan Butba told Reuters by telephone. Whoever leads Abkhazia, it will continue to have close ties with Moscow, on which it depends for political and economic assistance. The opposition describes the unrest as a local issue and draws no parallels with events outside the province. 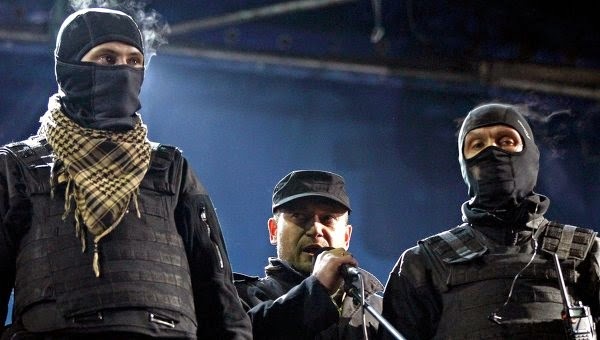 Officers of the Russian Federal Security Service (FSB) have detained members of Ukraine’s Right Sector terrorist group in the Republic of Crimea, the agency reported on Friday. “The group plotted terrorist attacks in the cities of Simferopol, Yalta and Sevastopol, and later on they planned to destroy several facilities, railway bridges and electricity lines,” the source said. “As we searched the places where the participants in the terrorist community lived, we found and confiscated explosives, guns, ammunition, canisters with incendiary mixtures, construction helmets (similar helmets were used in riots in Kiev’s Maidan), respirators, gas masks, tinned paint, nationalistic attributes,” the source said. The decision to establish self-defence units was made at a rally on May 22 by residents of the village of Sogratl, Gunib District of Dagestan. The units will reveal persons involved or helping the activities of illegal armed formations (IAF). More than 300 participants of the rally condemned the execution of policemen in the outskirt of the village on May 15, as well as the criminals who blew up on May 8 the monument to the soldiers of the Great Patriotic War (WW II). Villagers demanded from law enforcement bodies to investigate these two crimes as soon as possible, the RIA "Dagestan" reports. According to the villagers, in recent years the situation in the village is strained by the members of the local Salafi unit. The residents of Sogratl who spoke at the rally noted that this problem is ignored by the population, which is "passively watching the events." Some of them called to resettle Salafis out of the village. The leader of an outlawed terrorist group from Uzbekistan has been detained near Moscow with a stash of weapons and a phony passport, news reports said. The suspect, believed to be the leader of the Islamic Movement of Uzbekistan, had in his possession an AK-47 assault rifle, an altered traumatic pistol, a homemade silencer and large quantities of ammunition, Interfax said Wednesday, citing the Interior Ministry's press service. The leader of the group was identified in the report as a 27-year-old citizen of Tajikistan who "was actively involved in recruiting migrants from Central Asia." Local officials in China's western Xinjiang region held a public rally for the mass sentencing of criminals on Tuesday, handing out judgments for 55 people and at least three death sentences for crimes such as "violent terrorism", state media said. 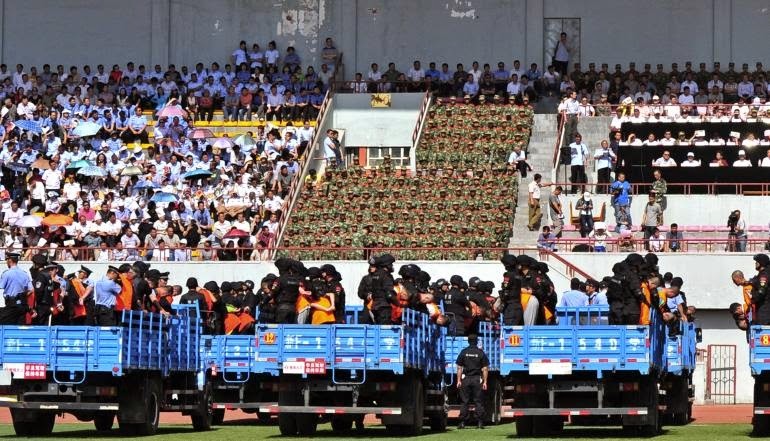 The public sentencing, reminiscent of China's revolutionary era rallies, attracted a crowd of 7,000 at a sports stadium in Yining city in the northern prefecture of Yili. Anti-terror police in Xinjiang claimed to have scored a “major victory” after officers swooped on a “significant terrorist group” and raided two bomb factories, according to the local Communist Party mouthpiece, the Xinjiang Daily. Police arrested five suspects who allegedly planned to bomb a crowded public place in the troubled region’s Hotan prefecture, the report said. Officers seized 1.8 tonnes of explosive material. The planned attack, allegedly to be led by Abuliz Dawut, was said to have been modelled on the deadly explosions that rocked an open-air market in Urumqi last week, according to the Xinjiang Daily. The Xinjiang Uygur autonomous region plans to offer a cash subsidy of 500 yuan ($80) to every tourist to the region, in a bid to revitalize a tourism industry that has been damaged by recent violent terror attacks. Xinjiang’s tourism has suffered since early this year after a March 1 terrorist attack at Kunming railway station in Yunnan province and a stabbing spree and explosion at Urumqi railway station on April 30, said Inam Naiserdin, director of the Xinjiang Tourism Bureau. "Last winter we welcomed many tourists coming to ski or skate," the director said. "But since March, inbound tourists have dropped by about 40 percent compared with the same period last year."